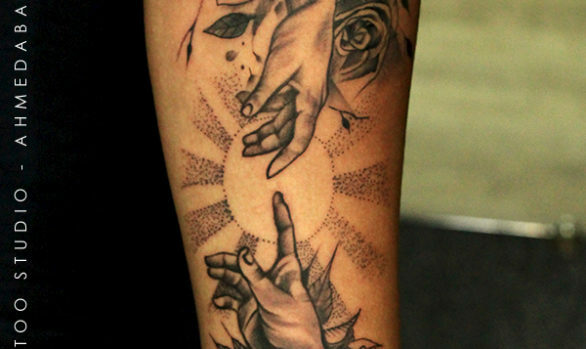 With so many tattoo enthusiasts opting to use their choice of body art as a means of expressing their individual beliefs and characteristics, there has been a significant rise in demand for faith-themed tattoos which make both a moral and personal statement. The Hindu God of Destruction, Lord Shiva, is definitely one of the most favored and as the God of the Yogis too, he is immensely popular with those who want a design to reflect their spiritual beliefs, as much as their theological ones so let us find out more about the Lord Shiva tattoos. The Hindu gods were not mythical beings or a figment of rich imagination. He believes that they were creatures of flesh and blood, like you and me, and that they achieved godhood through their karma, their deeds. He believes that the words Vishnu and Mahadev are not individual names. They are in fact titles, given to persons who are the greatest of leaders, who become god-like. His calm nature and the strong physical appearance are two opposites in this tattoo. Lord Shiva is an integral one of the Holy Trinity in Hinduism. Brahma, Vishu and Maheshwar (meaning Shiva) form the cycle of creation, preservation and destruction in the Universe. Lord Shiva is the Destroyer, but creation is also incomplete without him. You cannot create something unless your destroy the things that exist before it. There’s a small part of Shiva’s life that we would like to share. At one point of time, the Devas and Asuras collaborated with each other to churn the great ocean. Churning the ocean would please the Sea God and a pot of ‘amrit’ or elixir would come from it. But with the amrit, a phenomenal amount of poison was also generated from the ‘Samudra manthan’. This poison was enough to consume the entire Universe. But Lord Shiva magnanimously drank all the poison. Goddess used her powers to stop the poison in his throat itsef. The poison turned his throat blue and that is why he is called the Neelkanth. Lord Shiva is often portrayed as the supreme ascetic with a passive and composed disposition and that is what we wanted to capture in this particular tattoo. Although a very complicated deity, Shiva is one of the most fascinating of Hindu gods. Shiva is ‘shakti’ or power, Shiva is the destroyer, the most powerful god of the Hindu pantheon and one of the godheads in the Hindu Trinity. Known by many names – Mahadeva, Mahayogi, Pashupati, Nataraja, Bhairava, Vishwanath, Bhava, Bhole Nath – Lord Shiva is perhaps the most complex of Hindu deities. As body art, Lord Shiva designs can go anywhere on the body from your arm to your shoulder blade but giving the design a twist definitely makes it unique.